Computer performance can easily get degraded with growing of junk files in your system over time. There are some utilities available in the market that can help you clean it up but in case you are not truly satisfied with any of them, why not give this utility a trial? Named as DiskMax, it is a free utility that can be used to maximize hard disk utilization efficiency by removing unwanted files from your Windows system. Designed in user-friendly interface and is easy to be used, it is bundled with 3 types of scan profiles namely Quick, Standard and Detailed. Scan profile is a collection of scan sections and so with different profiles cover different type of scan sections, you can choose any one of the profiles based on your personal preference. Once after launched, you will be asked to choose respective scan profile and it will start the scan process accordingly. During the scan process, ‘user prompts’ will be popped up when DiskMax is unsure of your preference, just choose Yes or No and it will continue with the decision you provided. However, if you don’t want the ‘user prompts’ to be popped up in the future whenever DiskMax is executed, make sure ‘Remember my answer’ is selected so that the answer will be kept for future reference. A quick report is displayed each and every time the scanning process is completed. The report will summarizes number of files have been deleted, space has been recovered, number of files to be deleted when Windows is restarted, space that will be recovered when system is restarted, total space has been recovered and total time taken to complete the scanning process. Besides, DiskMax will generate a log file which contains a detailed report such as what are those files that have been deleted, and you can easily get the log file under the name of DiskMax Log.txt at user profile directory. For instance, C:\Users\MyDigitalLife\DiskMax Log.txt for Windows Vista and C:\Documents and Settings\MyDigitalLife for Windows XP. The contents of the log file will be erased during the next run of DiskMax. • Empty recycle bin, delete installation leftover and debugging information. 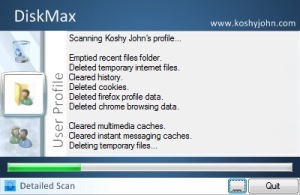 • Clear user’s History, Temporary Internet Files, Cookies, error reporting logs and etc. • Clean up Windows cache, internet logs, repair information, DLL caches, Logs, temporary files and windows update roll-back files. • Cleans up after Vista SP1/SP2 install. • Delete registry entries for multiple Most Recently Used lists. • Remove all files type such as log, old, prv, chk, swp, bak, gid, wbk, tmp and dmp. Howerver, this action is optional and you can choose to not remove them if you would like to keep them for troubleshooting. • Defragment Hard Disk space. DiskMax 4.15 is absolutely free for download and is compatible to run in Windows XP/2003/Vista and even Windows 7. Download it at here to ensure your PC is always in optimum performance for much more effective work in daily life.